Things will soon get far more hectic, surprising, and involved for my dad and his family. At this point 75 years ago it was all still in limbo. Through mid-April the only mention of Buddy this month in my grandmother’s diary was that she either received a letter from him or sent him one or a “box,” most likely of food. During this break in the action I have been researching the how and what of training for medics. I have found a number of helpful manuals and reports on the Internet. One is The Instructors’ Guide for Medical Department Mobilization, September 1942 and the other is part of the series on World War II history, this volume from 1974 on the Army Medical Department Medical Training in World War II. They give a clear picture of what the US Army Medical Department faced in the early years and how they developed the world class medical units that were indispensable. First, some background from the pre-war years as reported in the history. Training facilities of the U.S. Army Medical Department in 1939 reflected adaptation to peacetime medical requirements. 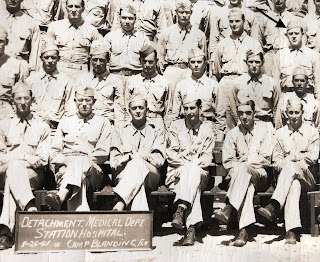 From a World War I peak of over 340,000, the Medical Department’s strength had been reduced to a little over 11,500 officers and enlisted men by June 1939. … The five Medical Department field units that existed were either understrength or skeleton organizations; trained enlisted cadre could not have been provided in case of mobilization. The ultimate purpose of all Military Training is the assurance of Victory in war! An Army must be trained to do its job in the most effective manner if it is to reach victory with the least possible losses to the country. … Attached medical personnel and Medical Department units must be prepared to support the offensive spirit and actions of the Armed Forces. … Units must be trained to function effectively in any type of military operation. The well-trained medical unit will increase the offensive spirit by assuring combat personnel of adequate medical service at all times. [E]nlisted men were to receive 13 weeks of basic training. [It] was divided into two phases: The first, a period of basic military training; and the second, a period of basic technical and tactical training. After 2 weeks of basic military training at the beginning of the cycle, the trainee was expected to be able to display and care for his uniform and equipment, to understand military courtesy, and to have acquired a fundamental knowledge of such basic military subjects as individual defense and march discipline. The third to 13th weeks of the program were devoted to basic technical and tactical training. Training in basic military subjects continued, but after the second week of the cycle, the program stressed basic technical subjects that would prepare men either for specific duties or for further training at a medical unit or installation. During this period, men were also trained to march and execute tactical movements, to establish and operate battalion or regimental dispensaries, and to maneuver with the combat arms in the field…. Looking at the 1942 Instructors’ Guide gives a decent outline of what the training was supposed to look like. The preliminary training of the individual enlisted man will be stressed. At the end of this period he should be able to wear properly, display, and care for his uniform and equipment; understand and correctly practice indoor and outdoor military courtesy; and have an applicatory knowledge of the essentials of all basic subjects prescribed in this program. Emphasis is placed upon fundamental technical subjects which will fit him for actual practice or further training in a medical unit or installation. In addition to the technical subjects, specialist training, tactical and logistical training is begun. Fundamental technical subjects were covered such as establishment and operation of stations, collection and treatment of casualties in the field, the operation of regimental and battalion dispensaries; and the preparation for participation with the associated arms in field exercises and under combat conditions. This period should be devoted largely to field and applicatory exercises. At the end of this period personnel intended for tactical medical units should be able to march and execute tactical movements with facility, establish and operate stations, collect and treat casualties in the field during day or night, operate battalion or regimental aid stations, and participate with the associated arms both in field exercises and under combat conditions. It appears that in the last quarter of 1941 the basic training portion was shortened to 11 weeks. But by then my dad would have already completed both basic and specialist training as outlined in the Manual. My Dad was part of the initial mobilization in the two years of 1939-1941. As I talked about in an earlier post, he registered for the draft as required on the first day in October 1940. His enlistment date was January 13, 1941. I assume that because of his own civilian training as a pharmacist he went though both basic training and medical orientation as listed above. 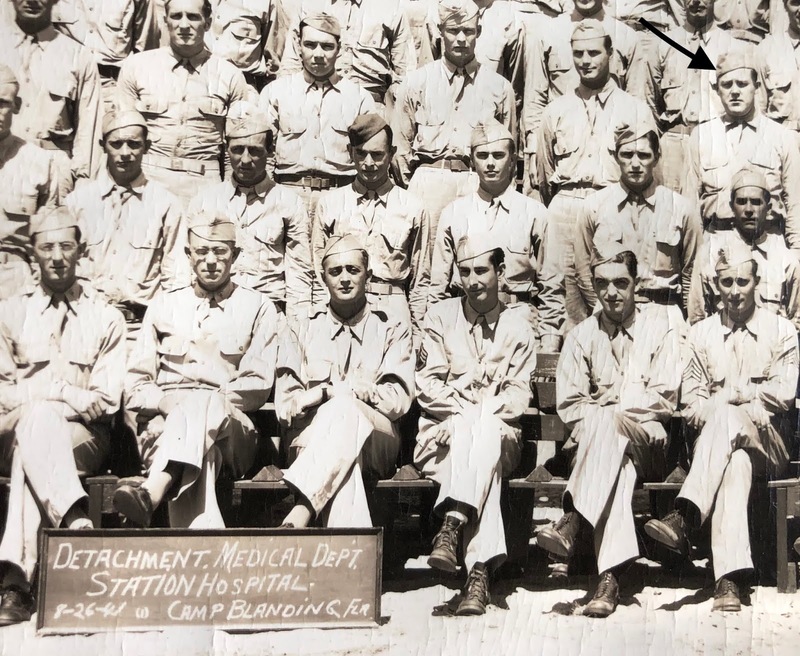 The one thing that supports that assumption is a picture I have of medics from the hospital at Camp Blanding, Florida in late August 1941, over seven months into his year. As I have said elsewhere, I have no diary from my grandmother to confirm any information. So far I have hit dead ends on following him in that first period of service. If, as I assume, he was trained in his eventual specialty- surgical technician- this all would have taken him until mid-July 1941. Did he stay for further training or to develop skills? Camp Blanding is not listed as a medical training facility in anything I have found. Was he sent home early since the space was needed for increased training when the draft was extended in 1941? All I know for sure are the dates above, the picture from Camp Blanding, and that by January 1942 (perhaps earlier) he was home and remained at home until activated in August ’42 into the 80th Armored Medical Battalion. Now, in April 1944, he was a medic with the 10 Armored Division’s medical battalion, no doubt “enjoying” these last months before going overseas. D-Day was less than six weeks away and then everything would change.